We have a corporate font which is behaving perfecly elsewhere, but fails to recognize regular (and bold), detecting only italic and bold-italic styles. Try to define a style. Detect or at least accept "Normal" or "Regular". Which font it is? Without this information it is not possible to investigate. How work other fonts ? Don't know which developer might be knowledgable in this area, font support on OSX using Apple's new API is afaik incomplete / not fully implemented. Alex: Since you marked all the bug reports as duplicates of this one, maybe you could give more details about what's common to them. Currently, this report is much less detailed than the duplicates, and the font needed to reproduce is not easily available. Bug 71034 for example contains many more technical details and provides a reproducer with free/standard fonts. > technical details and provides a reproducer with free/standard fonts. Not being a developer, I could well be wrong, but it seems to me that the common issue here is incorrect weighting of a fairly large number of font families that occurred somewhere between 4.0 and 4.1 release, particularly with bold weights. All I know is that this issue has been with us on Mac since the transition between 4.0 and 4.1 and has had no takers thus far from any dev. If others deem it appropriate to reset the main bug to another one, then who am I to argue. You are. Stop messing around. Adolfo, I am not messing around. If that is how you consider my input then so be it, but I'm not going to stop just because you seem to take askance at the reports I either file or intervene in. Consider yourself more knowledgeable by all means, but dissing the non-dev people who attempt to help out in QA is not going to move this bug further towards resolution. Or perhaps you are implying that my place isn't here ? This bug is still affecting versions 5.1.3.2 and 5.2.0.0.beta_2. Attached are screenshots of "Font Book" and LibreOffice 5.1.3.2 where you can see that the "Medium" variant of "Fira Sans" is missing in LibreOffice (although working everywhere else). "Fira Sans" is a free font from Google, you can download it to reproduce there: https://www.google.com/fonts#UsePlace:use/Collection:Fira+Sans. With the move to harfbuzz and the recent coretext changes made in 5.3, shouldn't we be asking people to retest with current production release and reporting back ? The freely available Overpass typeface from Red Hat has enough weights (8 plus italics) to clearly demonstrate the problem. What happens with typefaces like this is that some of the weights will fail to show up in the font selector in LO. And of those that do show up, some will randomly produce the wrong weight. Testing just now, I'm missing "Extra Light" and "Heavy" entirely. "Thin" and "Light" both produce the the same weight. As another example, I have the commercial typeface Akagi in a five-weight configuration. The heaviest one (Ultra) will not show up in LO. Using the second-heaviest (Extra Bold) actually produces Ultra instead. Disabling Ultra in Font Book makes Extra Bold work correctly. Re: comment #26, but where would different styles of a typeface show up in LibreOffice? Doesn't LibreOffice only have a selector for typeface "family", and then one can only modulate that using the Bold and Italic buttons? You don't see separate entries in the selector for "Liberation Serif Regular", "Liberation Serif Bold", etc either. But yeah, I guess there could be some logic to add more entries when a typeface family has more than four variants, or something. Not sure why that would be a Mac-spefici feature, though? And anyway, bug #35538, that this bug now is marked as duplicate of, is cross-platform, not Mac-specific. > Serif Regular", "Liberation Serif Bold", etc either. The Bold and Italic buttons are merely shortcuts for certain styles, but a font can contain many more styles or weights than just two. Ooh, I didn't know/remember that, interesting. IMHO the style selector should ideally be visible in the toolbar, too, if (as it seems) it is more and more common that typefaces have more styles than just the boring R/B/I/BI. Wonder if there is an enhancement request for that already. Anyway, for me all the styles of the Overpass typeface do show up in the Character:Font dialog? And I am able to choose for instance the Thin Italic style. It also saves that to .odt, and reloads it correctly. But when roundtripping through .doc or .docx, the "Overpass Thin Italic" indeed turns into plain Overpass Italic. So is that the actual problem then, that only the four traditional styles of a typeface can be saved to / loaded from the .doc or .docx formats? It probably would be a good enhancement request to want the full style selector (or "typeface selector", if one insists on using the Mac terminology) to be part of the normal toolbar. Also, interoperability of those additional styles in .odt documents is broken with Word 2013, at least. But in general, my advice would naturally be that if one wants as good roundtrippability, interoperability, and cross-platformness as possible, one should stick to the traditional four styles of well-known fonts available either as such, or as metrics-compatible equivalents, on all platforms. Right, they show up in the list, but go ahead and compare Light with Thin, or Light Italic with Thin Italic. It's using the same font for both! It's as if there's a limit to the number of styles that LO can actually use at once. If you disable (via Font Book) the style that appears in place of another style, the previously unavailable style becomes available. So it's not a case of LO failing to understand some styles at all; they just can't be displayed simultaneously for some reason. > It also saves that to .odt, and reloads it correctly. Yes, but open it in LibreOffice Windows (with the same typeface installed, of course). Or, on Windows, choose "Calibri Light" (for example), and open it on macOS. > broken with Word 2013, at least. "Microsoft Word [2016 ?] currently focuses on Family Name and Style Name, or the WWSFamilyName and WWSSubfamilyName, if present. WWS stands for Weight, Width and Slope." where you see the family name, style, weight, and an internal ID (a pointer value). > the fonts, not the style name as a string. Yeah, I suspected something like this might be happening. But where is LO pulling the weight number from? Does it simply make it up? I can't imagine all these fonts containing some kind of weight attribute that is not unique within the family. So Light should be distinguishable from ExtraLight or Thin, but ExtraLight has the same weight as Thin, so distinguishing between those would be harder. Interesting. So is this an Apple bug? Apple's own Pages handles Overpass (and other multi-style typefaces) just fine. Perhaps the CoreText-supplied weight value should be used for ordering at most and use the actual font names to distinguish between variants. As can be seen, with this patch Light is different from ExtraLight, but Thin still turns up the same as ExtraLight (as expected, as their weight is identical). Sure, there are lots of things that could be done. This particular fix above was very small and easy. (But still took almost one work-day to investigate and figure out.) There are not really much resources available for a more thorough re-work. Well, even if we have to rely on the CoreText-supplied values for now, what's the point of doing proprietary arithmetics and guessing the intended weight, when the possible values and their interpretation is apparently well-defined? Overpass Thin has weight -0.5, but NSFontWeightThin is -0.6. Fun. Let's keep this separate from bug 35538, it's more helpful if platform-specific discussions/fixes are separate, and don't get confused with each other. Okay, I'm inclined to file a bug with Apple about CoreText returning the same weight value for two clearly distinct weights. But... Even if CoreText returned unique weights, would this thing still work? Looking at the patch posted above, it looks like LO is shoehorning the weights into its own weight classification system (WEIGHT_NORMAL, WEIGHT_THIN, etc.) anyway. Does this also stand in the way of supporting fonts with a large number of weights? and that is then mapped to different values of the LibreOffice enum FontWidth: Overpass Thin gets WIDTH_ULTRA_CONDENSED (the 1 above) and Overpass ExtraLight gets WIDTH_NORMAL  (the 0 above). 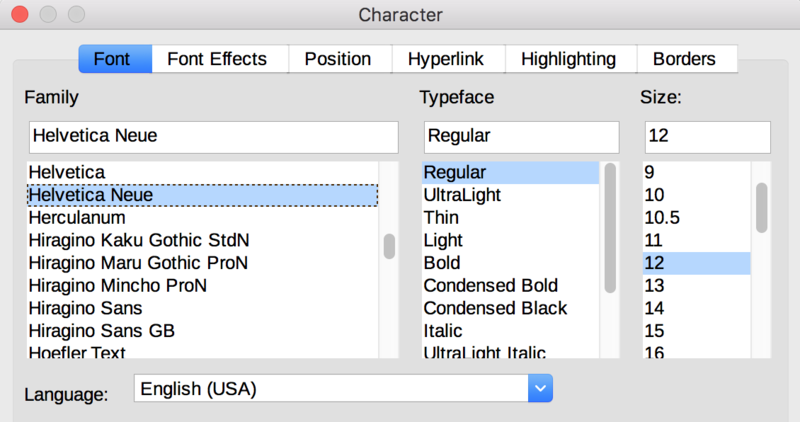 But I don't see in the LibreOffice Character...:Font dialog a way to select the width of the font? Yes, seems so. If a typeface has more than 9 weights, those could not even in theory be distinguished by LO's FontWeight. (And in practice, it is likely that the mapping from the floating-point weights to the enum will cause overlaps anyway even for less than 9, as seen originally here where both -0.5 and -0.4 were mapped to the same WEIGHT_LIGHT). But according to Apple's documentation, macOS does not use the OS/2 metrics table. So do the font files contain a second set of metadata somewhere that is wrong, or is CoreText making things up? Also, I just noticed that, for me at least, the Extra Light weight is missing from the LO UI. To summarize, Light and Thin are listed but rendered identically, while Extra Light is missing completely. But is that with the patch above or not? And yes, it does seem likely that CoreText is just making things up;) It's just software, presumably with layer upon layer of bugs and fixes and hacks and backward compatibility. Just like LibreOffice. Also, as the Overpass typeface that I have been using to test now was designed by Red Hat, it is likely that it is "tuned" to match typical FLOSS stacks, i.e. fontconfig, freetype, harfbuzz etc, and has not necessarily been tested that much by its designers on macOS. If that matters. All fonts are correctly viewed in Font Book, TextEdit and Apple Pages (version 6.3.1). Fira Sans is presented as 3 families: Fira Sans, Fira Sans Compressed, Fira Sans Condensed). All fonts are (almost) correctly viewed in Microsoft Word 2016 for Mac (version 16.9.1). Fira Sans is presented as 5 families: Fira Sans, Fira Sans Eight, Fira Sans Four, Fira Sans Hair, Fira Sans Two. But: Fira Sans Condensed Book (and Italic) and Fira Sans Compressed Book (and Italic) are presented as Fira Sans Condensed 350 and Fira Sans Compressed 350. Fira Sans Book is presented as Fira Sans Book. EB Garamond: 4 styles are missing. Fira Sans is presented as 3 families: Fira Sans, Fira Sans Compressed, Fira Sans Condensed. Fira Sans: 16 styles are missing. Fira Sans Compressed: 16 styles are missing. Fira Sans Condensed: 14 styles are missing. So, it seems that LibreOffice 6.0.0 on macOS effectively handles italics and stretches, but fails on some weights, in both extremes of the spectrum and in the middle. could be interesting documentation. The discussion is very informative. > Compressed, Fira Sans Condensed). > Book is presented as Fira Sans Book. > EB Garamond: 4 styles are missing. > Fira Sans: 16 styles are missing. > Fira Sans Compressed: 16 styles are missing. > Fira Sans Condensed: 14 styles are missing. The same test (almost: LibreOffice 6.0.2, Fira Sans 4.3 https://bboxtype.com/typefaces/FiraSans/ ) on Linux gives very similar results. See bug 98596. So this "coretext" is stuffing all fonts into one of these 10 weights. And as mentioned above, coretext is assigning different weights the same weight. This causes multiple fonts to be assigned the same weight, causes conflicts, and display errors. Fira Sans has 16 visual weights. These are the weights designated in the font files. There is no way coretext can stuff all 16 of those into 10 weights. Google fonts only shows 9 weights (which fits nicely with CSS). They simply ignore the rest. There is no reason why this should not work properly. Assigning the first three fonts the same weight (see above) makes no sense. The Medium and SemiBold should work properly (see above). I do not see how this coretext thing can ever work properly with modern typefaces. LO is already displaying the unique Full Font Name from the font file. And the bold and italics buttons still work where appropriate. Most modern fonts have structured the font info fields to work either way. If the weight is needed to map to HTML for example, just read it from the font file. It looks to me that coretext will never work. Or can someone please tell ignorant me how it possibly can work. Why is coretext needed for selecting fonts when the metadata can be used instead? "There is no reason why this should not work properly"
Congratulations, you have now discovered the simplest definition of what a bug is. > So this "coretext" is stuffing all fonts into one of these 10 weights. Not exactly. https://bugzilla.gnome.org/show_bug.cgi?id=766148 is a must-read. LibreOffice seems to do that, yes. > It looks to me that coretext will never work. My tests show no bug in Font Book, TextEdit, Apple Pages and MS Word (well, almost for Word). > Or can someone please tell ignorant me how it possibly can work. Keep in mind than the same behavior (almost) is observable with LibreOffice on Linux, so CoreText isn't the real problem. > > So this "coretext" is stuffing all fonts into one of these 10 weights. It is surprising after reading through that entire thing that the bug was marked fixed. The tables in Comment 8 show the same issues we have here. The same OS2 weight being mapped to multiple Pango-CoreText weights. The results in the different tables were all over the place. It is easy to see why Fira Sans Book, Regular, and Medium get broken. > > and display errors. > LibreOffice seems to do that, yes. > > It looks to me that coretext will never work. I expect that any font utility will work correctly. The three different font management utilities on my Win 7 system all list the fonts correctly, and display them correctly. The fonts all display correctly in InDesign and in QuarkXpress. > > Or can someone please tell ignorant me how it possibly can work. > on Linux, so CoreText isn't the real problem. The issues seem pretty much the same. Multiple fonts being confused as one based on a faulty weighting system. I tested the fonts mentioned here and in that bug on my Windows 7 + LO6.0.3.2. Fira Sans, Overpass, EB Garamond 12, and Lato (9 weights), and others. With one commercial Pro font I gave-up and edited the font family to be unique for each weight and width I wanted to use. Works fine now in LO6. This issue appears to affect Mac, Linux, and Windows pretty much the same. From these two bug discussions, and the Pango bug discussion you linked to above, it appears this will not be working properly any time soon. According to https://www.collaboraoffice.com/community-news/recent-mac-specific-fixes-in-libreoffice/ the bug is gone. So, I did my tests again: in reality, nothing has changed. All fonts are correctly viewed in Font Book, TextEdit, Apple Pages (version 7.1) and Microsoft Word 2016 for Mac (version 16.14.1). Fira Sans is presented as 3 families: Fira Sans, Fira Sans Compressed, Fira Sans Condensed). So, it seems that LibreOffice 6.1.0 Beta 2 on macOS effectively handles italics and stretches (nothing changed), but still fails on some weights, in both extremes of the spectrum and in the middle (nothing changed). I think the same test on Linux will still gives very similar results. See bug 98596. Nobody has said that everything is perfect now. Some details for some specific fonts have been fixed. As can be seen from the actual commits. The webpage you linked to says "The fix for this was to simply handle these special cases separately. If resources allow and more similar problematic fonts are identified, some more generic fix would be needed." > fonts are identified, some more generic fix would be needed." Well… "If (…) more similar problematic fonts are identified": this kind of statement implies that the problems are yet to be discovered. I think my tests show a general problem, both on macOS and on Linux. That the same behavior occurs on two systems managing fonts in very different ways shows in my opinion (and for any observer, I think) that the problem is systematic. It would be more accurate to say: "we know there is a general problem, that it is still not solved, and we've only solved some very specific cases". I tested Overpass on Windows 7 today and found different issues. Perhaps on the different OSs different font meta data is used resulting in different issues. Thin and ExtraLight - wrong screen display and print output. Export to PDF is correct. There is an error in the SemiBold regular font file – it has the font family set to Overpass Light. After fixing this file the Overpass SemiBold regular displays correctly. There is an error in the OverpassMono SemiBold font file – it has the font family set to Overpass Mono Light. After fixing this file the OverpassMono SemiBold displays correctly. and then by fallback if missing, in each OS. And if this may be one source of issues. This is a Mac-specific bug report. It even says so in the title. Please don't confuse it by reporting findings on Windows here. Thomas: Of course any writing can always be improved. And depending on who one asks, one even gets different ideas how to improve it. Endless bike-shedding possibilities! But is this bugzilla really the place to discuss what was written in some marketing material some time ago? Also, yes, I don't think anybody who has worked on the code is unaware that the handling of styles of a font family in LibreOffice could be improved a lot, cross-platform. > discuss what was written in some marketing material some time ago? I only want to point out that the bug isn't about some bad fonts or some specific fonts. I've chosen three typeface families for testing (open source, no problem to download for everybody), but I could take 30, 300 or 3000 with the same kind of results. If this point is clear for everybody, fine! > don't confuse it by reporting findings on Windows here. I think part of the problem is these are not looked at together. Some of the problems appear to be font defects. Some of the problems may be the font meta data, or lack thereof. this is just a scattershot approach. Bundled fonts may be "corrected/enhanced* and some issues may go away. Right now this is just random problem reports. > I think part of the problem is these are not looked at together. > Some of the problems appear to be font defects. > Some of the problems may be the font meta data, or lack thereof. If you think fonts have bugs, please report them to their creator (it can actually happen, but it's rare, and if the tricks around the nameID 1 & 2 that were used 15 years ago to get around the problems beyond RIBBI are no longer those in favor today, it doesn't matter, as long as the nameID 4, 6, 16 and 17, possibly 21 and 22, are correct). > this is just a scattershot approach. > Bundled fonts may be "corrected/enhanced* and some issues may go away. Most of the time, proprietary licenses for fonts doesn't allow modification (and never, ever, distribution of modified fonts). So you've to deal with the fonts in the state they're in. I seem to be having the same problem on Ubuntu and on Fedora and I stumbled upon an interesting discovery. My fonts are installed system-wide (/usr/share/fonts) and initially are all recognized by libreoffice. Once I change the default language though, in my case from English US to English UK the different font weight/families are not recognized properly. The same happens with libreoffice installed from the repositories and from flatpak. > upon an interesting discovery. Hi, you're right, this isn't a Mac only bug: Linux bug is bug 98596. > > upon an interesting discovery. > > not recognized properly. > Hi, you're right, this isn't a Mac only bug: Linux bug is bug 98596. Well I know that it is not an Mac only bug. My point is I think i have found the source of the bug.